FIN pallets are made on the basis of SFS-EN 13698-2 standard, and are periodically inspected by INSPECTA (Northern Europe’s leading testing and inspection company with more than 1,200 employees) inspectors on the basis of strict quality procedures. Pallets can be 18 - 22% of moisture and heat treated with ISPM 15/IPPC marking. Pallet timber meets all the standard UIC 435.2 requirements. 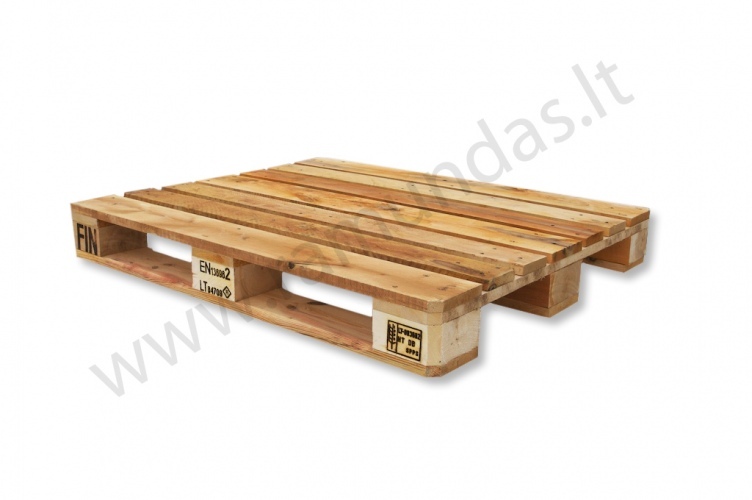 Depending on the layout of the cargo, pallet can withstand up to 2440 kg. Measurements: 1000x1200x147. Pallet weight: 30 Kg. Load weight: 2440 Kg. Pallets can be heat treated according the requirements of ISPM 15/IPPC.